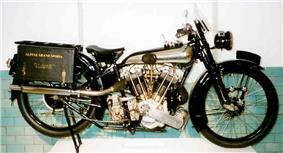 Motorcycle – single-track, engine-powered, two-wheeled motor vehicle. It is also called a motorbike, bike, or cycle. Motorcycling – act of riding a motorcycle, around which a variety of subcultures and lifestyles have built up. 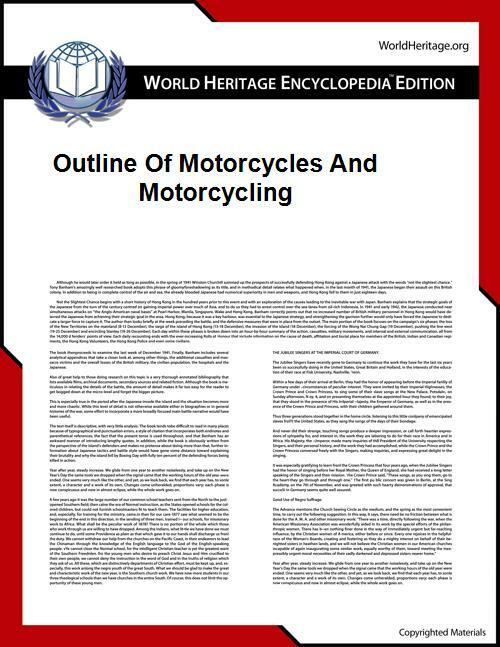 Legal definition of motorcycle – a powered two-wheel motor vehicle. Most countries distinguish between mopeds up to 49 cc (scooters do not count as a separate category) and the more powerful, larger, vehicles known as motorcycles. Many jurisdictions include some forms of three-wheelers as motorcycles. Street motorcycle – designed for riding on paved roads. Features smooth tires with a light tread pattern and at least 125 cc (7.6 cu in) engine. Cruiser – mimics the style of American machines from the 1930s to the early 1960s, including those made by Harley-Davidson, Indian, Excelsior and Henderson. Models evocative of the early cruisers make up 60% of the U.S. market. Bobber – usually has had the front fender removed, the rear fender "bobbed" or made smaller, and all superfluous items removed to make it lighter. 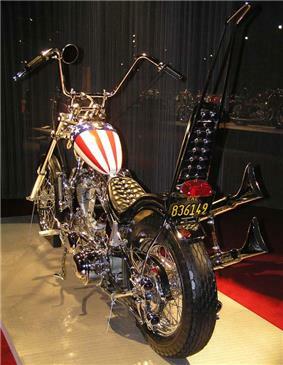 Chopper – has a longer frame design accompanied by a stretched front end (or rake). To achieve a longer front end, while the frame is being designed, the fabricator tilts the neck of the frame at less of an incline and installs a longer fork. Sport bike – optimised for speed, acceleration, braking, and cornering on paved roads, typically at the expense of comfort and fuel economy in comparison to less specialised motorcycles. Café racer – a type of motorcycle that has been modified for speed and good handling rather than comfort. 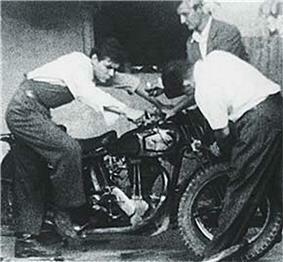 Cafe racers' bodywork and control layout typically mimic the style of Grand Prix roadracers of the 50's or 60's with or without fairings. They tend to feature an elongated fuel tank, a small, rearward mounted and humped single seat, and low, race style handlebars mounted on the front forks. Streetfighter – a sport bike that is customised by removing the fairing, with other changes that result in an overall more aggressive look. Touring motorcycle – designed for long-distance touring and heavy commuting. Although any motorcycle can be ridden to tour or commute, manufacturers provide specific models designed to address these particular needs. Sport touring motorcycle – blends performance with long-distance capabilities while providing comfort and relative safety to the rider, and tend to include accessories, such as a trunk or saddlebags for storage, to enhance the touring experience. 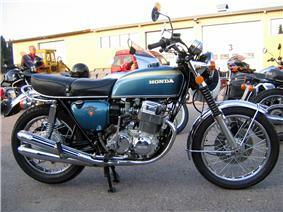 Standard motorcycle – versatile, general purpose street motorcycle, with an upright riding position. 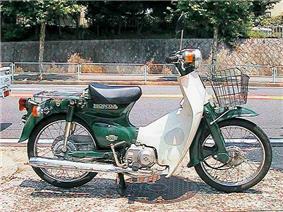 Universal Japanese motorcycle – Japanese motorcycle with a transverse air-cooled four-cylinder engine in a conventional tube frame with a dual seat, mostly made in the 1970s and early 1980s. Custom motorcycle – unique or individually produced in a very limited quantity, as opposed to stock bikes which are mass-produced. Is usually highly stylised or has an unusual frame geometry or engine design. Many styles including café racer, streetfighter, and chopper began as customized motorcycles before manufacturers mass-produced bikes styled after popular custom machines. Dual-sport motorcycle – type of street-legal motorcycle designed for both on and off-road use. Enduro motorcycle – motorcycle made specifically for the Enduro sport, with the long travel and medium-hard suspension of a motocross bike enhanced with motorcycle features such as a headlight and quiet muffler to make the bike street-legal for parts of the track. Motocross motorcycle a light weight, high power, off road competition race bike. Supermoto motorcycle A dual purpose, single cylinder, light weight bike fitted with equipment better suited to street riding or racing such as 18 inch front wheel and road tyres. 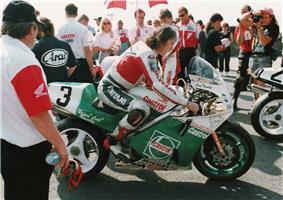 Track racing motorcycle – customised for track racing, with no brakes and fueled with methanol. Trials motorcycle – an extremely lightweight design, that lacks seating (designed to be ridden standing up) and that has suspension travel that is short, relative to a motocross or enduro motorcycle. Minibike – sometimes called a mini moto or pocketbike, it is a miniature motorcycle. Most traditional minibikes use a two stroke engine to turn the rear wheel via a chain. Mini chopper – mini choppers are scaled-down versions of choppers and are generally constructed from 1" steel tubing or 3/4" steel black pipe. The tube or pipe is bent and then welded together to get the desired angles and shapes of the frame, which is usually custom made. Moped – a type of low-powered motorcycle designed to provide economical and relatively safe transport with minimal licensing requirements. 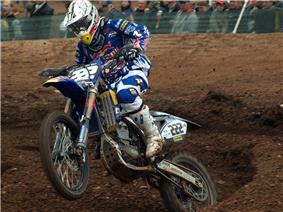 Pit bike – a small off-road motorcycle originally used for riding around the pits or staging area of a motocross race. Since the early 2000s pit bike racing, a sport similar to motocross, has become popular in the United States, especially in Southern California. Scooter – a step-through motorcycle with a seat, a floorboard, and small or low wheels. Most modern scooter designs have swingarm-mounted engines. Underbone – a step-through motorcycle with a structural downtube and conventionally sized wheels, but without a floorboard. 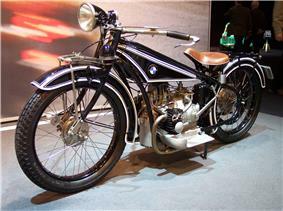 Electric motorcycle – has an electric motor powered by one or more batteries or fuel cells. Motorcycle chassis – includes the frame and suspension, along with the front forks, of the vehicle. Motorcycle frame – provides the strength and rigidity of the motorcycle; all other parts are attached directly or indirectly to the frame. Suspension – controls the ride and handling of the motorcycle by controlling the rate and distance of the movement of the wheels relative to the frame. Motorcycle fork – acts as suspension for the front wheel and allows the motorcycle to be steered. 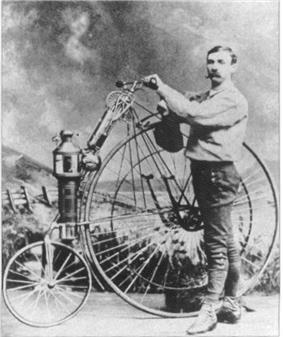 Shaft drive – low-maintenance alternative to chain drive, favoured by certain manufacturers, such as BMW Motorrad and Moto Guzzi, and also used on many large touring motorcycles. Speedometer – indicates the forward speed of the motorcycle. Odometer – indicates the distance travelled by the motorcycle. Tachometer – indicates the rotational speed of the crankshaft in the engine, often also shows an indicated safe limit called a redline. Fuel gauge – indicates the amount of fuel in the tank relative to tank capacity. Motorcycle tyres – have a round cross section to facilitate the leaning necessary when a motorcycle turns. Trail riding – riding outdoors on natural trails and roads. Land speed – a single rider accelerates over a 1 to 3-mile (4.8 km) long straight track (usually on dry lake beds) and is timed for top speed through a trap at the end of the run. The rider must exceed the previous top speed record for that class or type of bike for their name to be placed on the record books. Motoball (Motorcycle Polo) – similar to football, but all players (except goalkeepers) ride motorcycles, and the ball is much bigger. Pit bike racing – competition sport similar to motocross, using pit bikes. Patriot Guard Riders – formed in 2005 to provide an honour guard at the funerals of repatriated military personnel in the U.S.
^ a b c Brown, Roland (2002). 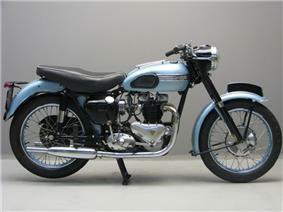 Classic Motorcycles. Joanna Lorenz. ^ "The Wild One". Retrieved 16 October 2010. ^ Timothy Shary; Alexandra Seibel (2007). Youth culture in global cinema. University of Texas Press. p. 17.